Where: Perth & Rottnest Island, Western Australia. Australia, Oceania. 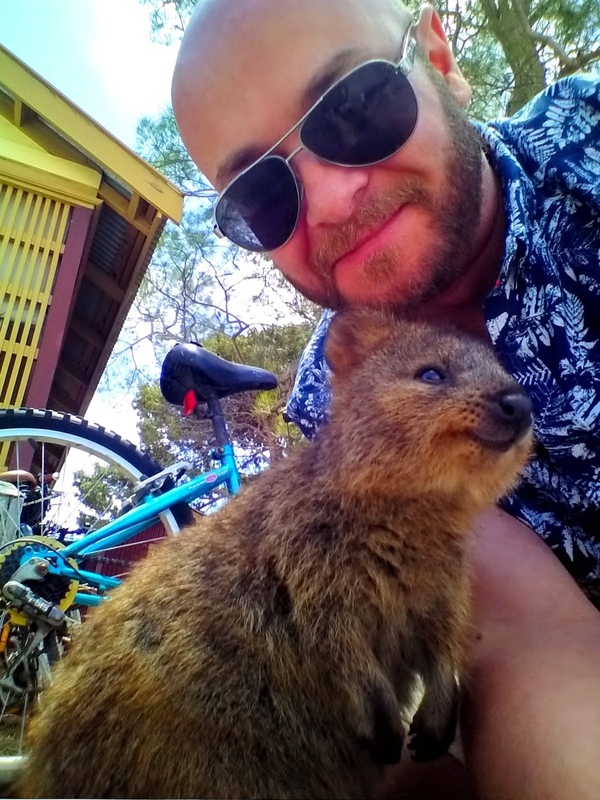 What: Elizabeth Quay and Quay Bridge, Spanda Sculpture, Perth city skyline, Island cycling, Rottnest ferry, World's longest flight (direct), Obligatory Quokka selfie. Mishaps or illnesses: Dealing with the first world problem of severe jet lag from a 17 hour direct flight from London. From London to Perth time in a single leap was a rather punishing transition. 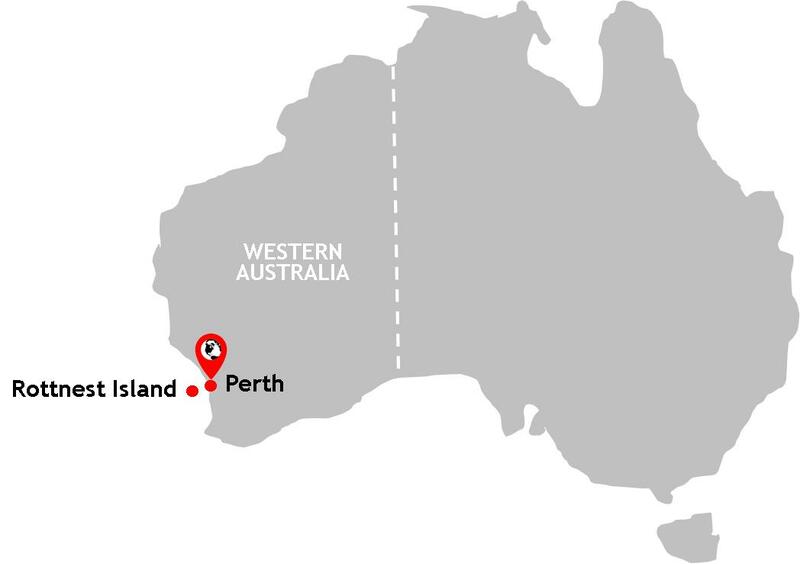 Western Australia looms large on the map of Australia being, as it is, the largest state in the country. To place this in context, the United Kingdom would fit inside WA an impressive eleven times. Western Australia so often misses out on the tourist dollar; unsurprisingly many are lured by the far-reaching appeal of Sydney's iconic Opera House. 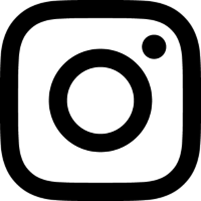 Many visitors include Melbourne as part of a road trip from Sydney and others head north from Sydney along the eastern seaboard as part of a road trip into Queensland hubs like Brisbane, Byron Bay or the Great Barrier Reef. WA gets what's left. And that isn't much. Admittedly this is completely understandable: people are short on money and even shorter on time - and WA is so far, far away. The 'problem' with travelling in Australia is that it is just so vast and not particularly affordable, either. This means that as a traveller keen to explore new places, I find myself flying abroad rather than around the country I am living in. For the same price as a destination in Australia - and sometimes for even less, I can fly to a new and exciting country in Asia or Oceania. This has pretty much characterised my thought process up until this point and explains why all of my destinations on this giant sunburnt country have been concentrated in Australia's south eastern states of NSW, VIC, TAS and the ACT. 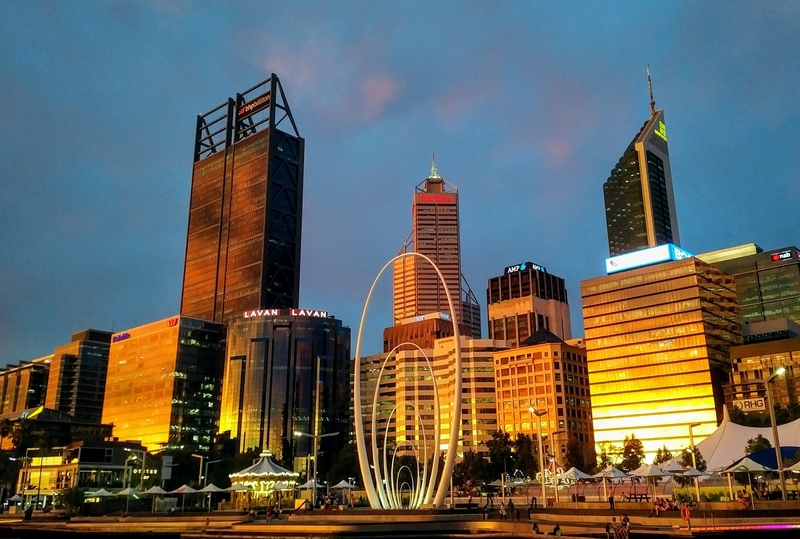 The WA government is taking steps to better market itself, as well as make the State capital Perth more enticing to would-be travellers putting together an Aussie itinerary. In a world of travel where there seems to be an ever-growing number of people clogging up any place worth seeing, I believe WA is an opportunity to have a cool city break with a few great day trips perfectly feasible beyond Perth's city limits without half of humanity getting in your way. Welcome to Western Australia - my sixth Australian State/Territory. A five hour flight from Sydney and a three hour time difference has meant that Perth has, up until this point, only ever been a city marked on the Australian weather map, a place tantalisingly in the same country but so very far away. A visit to the United KIngdom offered the perfect chance of a stop-off in Perth on the return leg, the Australian city with a distinctly Scottish name which looks out into the Indian Ocean and one of the most isolated cities on earth. Perth's relatively respectable skyline, comprised of generic glass corporate architecture which seems to characterise many an Australian city, is best viewed from a walk along the Elizabeth Quay Bridge. It's a pleasant little spot which unsurprisingly loses the battle against its East Coast rival Sydney. If you were hoping that Perth would offer a West Coast version of Sydney, you'll be sorely disappointed. 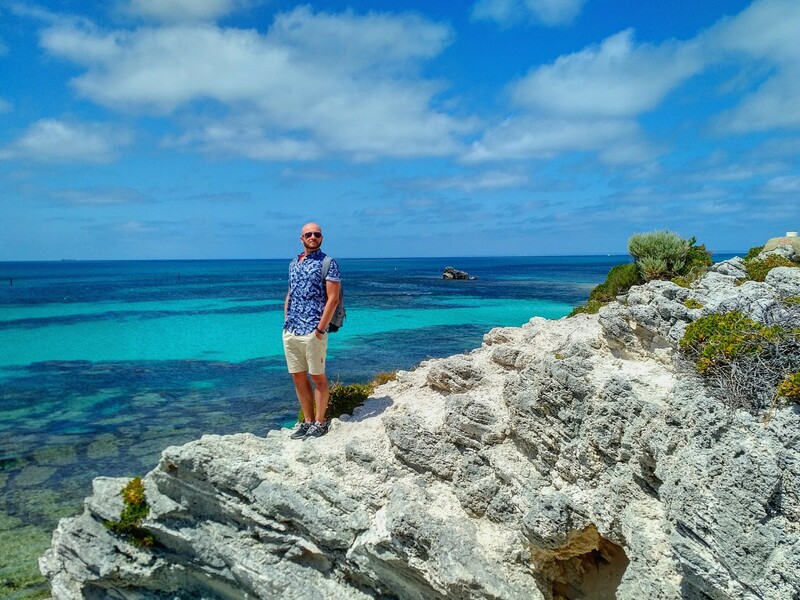 I must admit that, in my jet-lagged, caffeine-fuelled haze a quick trundle around Perth soon had me feeling justified in booking a day trip out to Rottnest Island. Something I have learnt about Australia is that it just doesn't seem to do cities very well. Indeed, this is perhaps signalled by the more functional name Australia gives to its city centres: the 'Central Business District' or CBD for short. In the UK the term 'city centre' perhaps captures the fact that a space is the 'centre' of city life and culture, whereas in Oz, the city centre is more concerned with money and transactions. Perth is no exception to this functional approach to city space: beyond its postcard-worthy skyline which, for a little blurring of the eyes, could be said to be impressive, the city streets feel devoid of character. Having spent the previous three days traversing and photographing one of the world's most dynamic and historic cities, London, the blandness of Perth felt even more marked. Perth is quiet. There is no rush hour to speak of. When I visited there was no traffic, no noise and no crowds. This also meant that one of my travel bug bears was also wonderfully absent - giant queues snaking around corners for anything you may want to to buy, inquire about or embark upon. Other cities may have the premium honey which attracts the majority of the buzzing hoards, but unavoidably this comes with a claustrophobic and stress-inducing high people count, oftentimes beyond what is manageable and tolerable. This means that Perth is a city break with a welcome USP: tranquillity, quick service and no time wastage. Although I'm keen to avoid travel writing cliche of 'ghost town' and 'eerie empty streets' in this Chronicle, it is fair to say that such cliche is not too far from the lived experience. Where was Perth hiding all of its people? Where were the office workers? Where were the cars at 5pm on a weekday eager to reach home? More accurately it is fair to characterise Perth as a city with a gentle, low-level hum of activity. It isn't frenetic, frantic or dirty and thus so unlike many cities I have traversed on foot around the world. 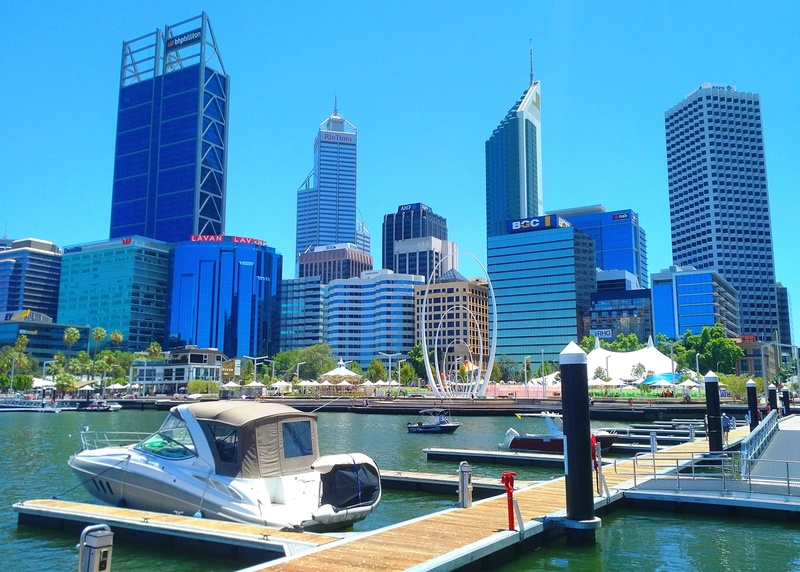 A wander away from what is probably most visitors' starting point in Perth, Elizabeth Quay, shows Perth to be a city building itself a future with tourists firmly in mind. The CBD has had some recent investment which has resulted in new and creative urban spaces. The trendy area of Northbridge will satisfy most people's dining and nightlife needs. Perth isn't my kind of city but it did make a nice change - especially after enduring one of the world's longest of long haul flights and the inevitable jet lag which ensued. I'm glad there weren't hundreds of people getting in my way, umpteen cars aggressively honking their horns and pumping pollution into the air and also glad we were the only people in the restaurant getting served instantly. 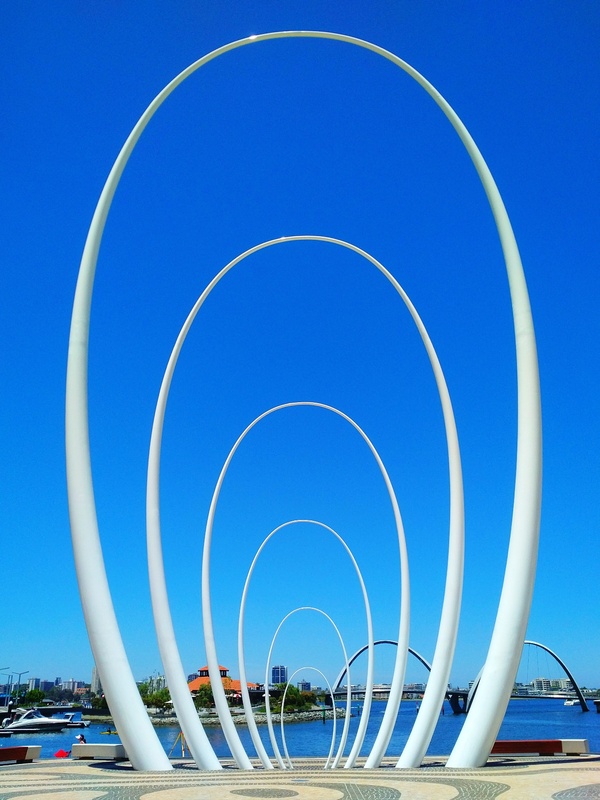 Perth's Elizabeth Quay featuring the Spanda sculpture. The Perth skyline turned orange by the setting sun. 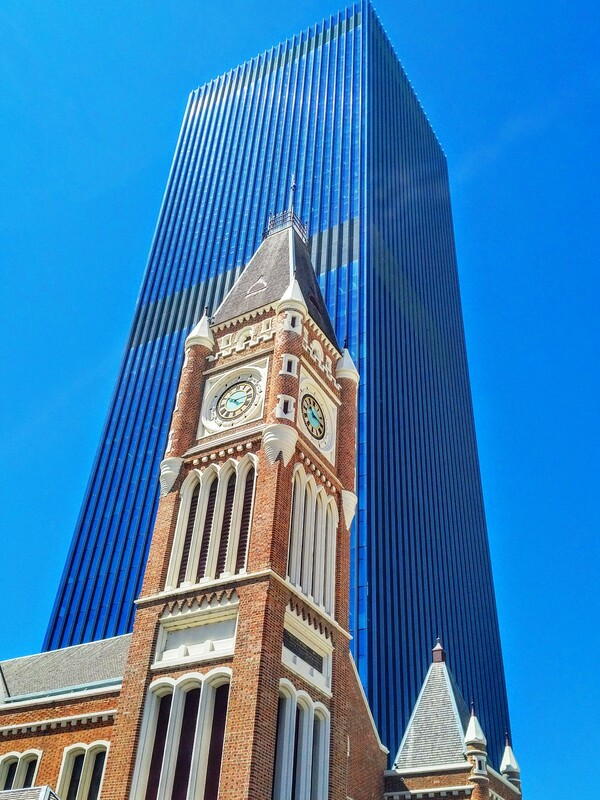 Perth Town Hall set against generic glass architecture. The Spanda Sculpture looks out into the Quay and beyond. 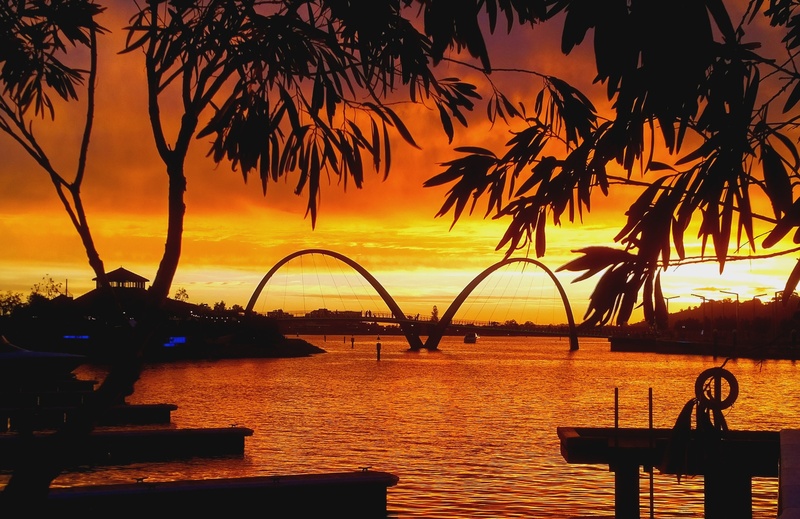 A silhouette of the Elizabeth Quay Bridge is featured centrally amid an incredible sunset. No filter was necessary. Rottnest Island is one of WA's most popular tourist draws. Quokkas, the cute little marsupials which hover somewhere between giant rat and Wallaby, are the State's answer to the Kangaroo, Koala and Tasmanian Devil and a major part of its strategy to boost tourist numbers to Australia's West. A lot of weight rests, therefore, on the little fluffy shoulders of an endangered species which has all but been wiped out on the mainland falling prey, as they do, to cats and dogs. Apart from one area in WA's far north, Rottnest is the only other place where you can get up close to these cute and placid little creatures. Access to Rottnest Island comes in the form of a ferry journey either from Fremantle further up the Swan River or Perth city. I'm not great on boats, particularly after a horrible experience on a Sydney Ferries service to Manly where the vessel made its way through some swell, and so it was with some trepidation that I embarked upon the 90 minute journey down the Swan River and out into the Indian Ocean to reach the island. As it was the journey was mostly plain sailing except the final third of the leg out in the ocean where the catamaran regularly lurched from left to right and appeared to skid across the water's surface diagonal-wise. It didn't take long for us to spot our first Quokka on the island and, as the day wore on, they were positively ubiquitous. Aside from their undisputed cute factor, what is most remarkable is their placid and friendly nature. If you're especially lucky, as I was, you may spot a mother Quokka carrying a joey in her pouch Kangaroo-style.On several occasions these magical little things approached me rather than the other way round, one even taking to sniffing my face during my attempts to take the obligatory 'Quokka selfie'. With so much Aussie wildlife being feisty or, let's face it, positively dangerous in nature, it's really quite something to be able to interact with these wonderful, smiling creatures at such close quarters and for them to feel quite happy doing so. 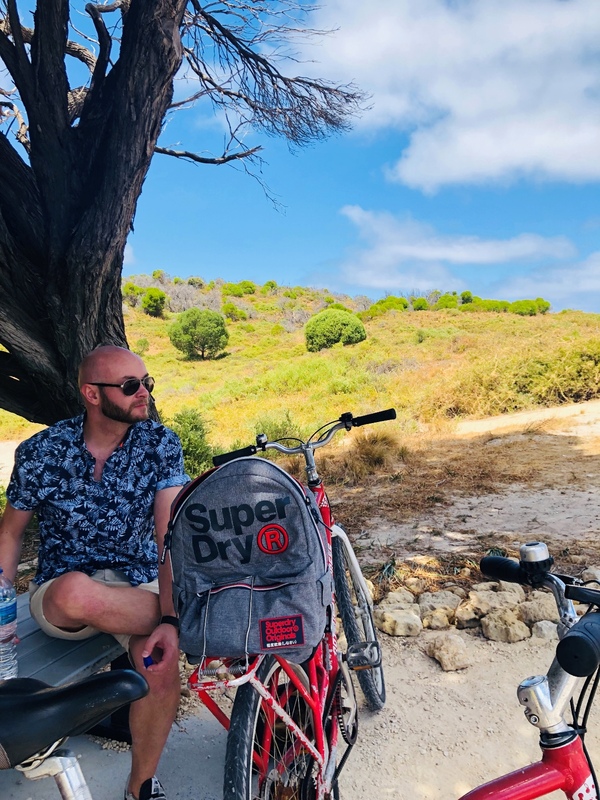 By far the best way to get around Rottnest is by pedal power. Rottnest rest stop: it is rather a hilly island. A palette of blues and turquoises. It was a beautiful day in WA. 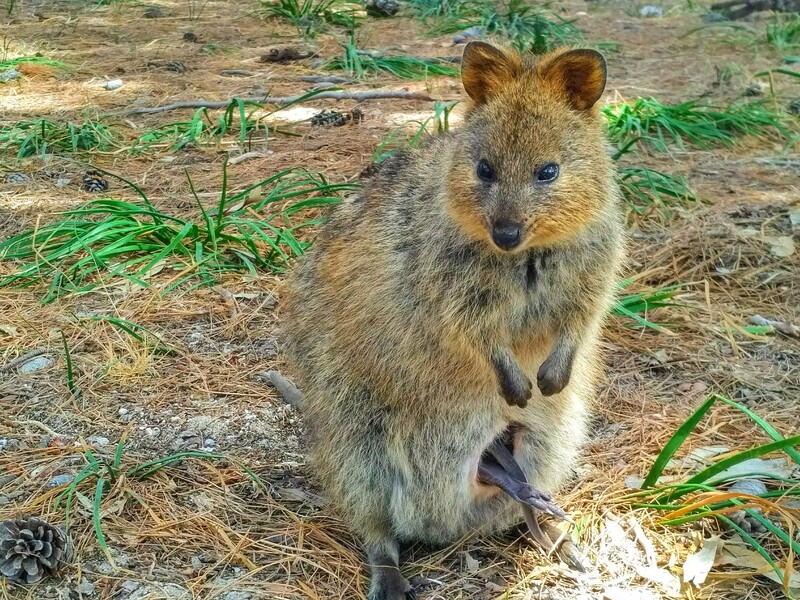 Meet a lady Quokka with a little joey in her pouch. Quokkas are only found in some remote parts of Western Australia. Perth's relatively respectable skyline, comprised of generic glass corporate architecture which seems to characterise many an Australian city, is best viewed from a walk along the Elizabeth Quay Bridge. Ferry trips out to Rottnest are becoming increasingly popular. Therefore book your ferry ticket well in advance. It also means that the island is quite crowded and could quite soon become like so many other tourist traps. We journeyed with the Rottnest Express company. 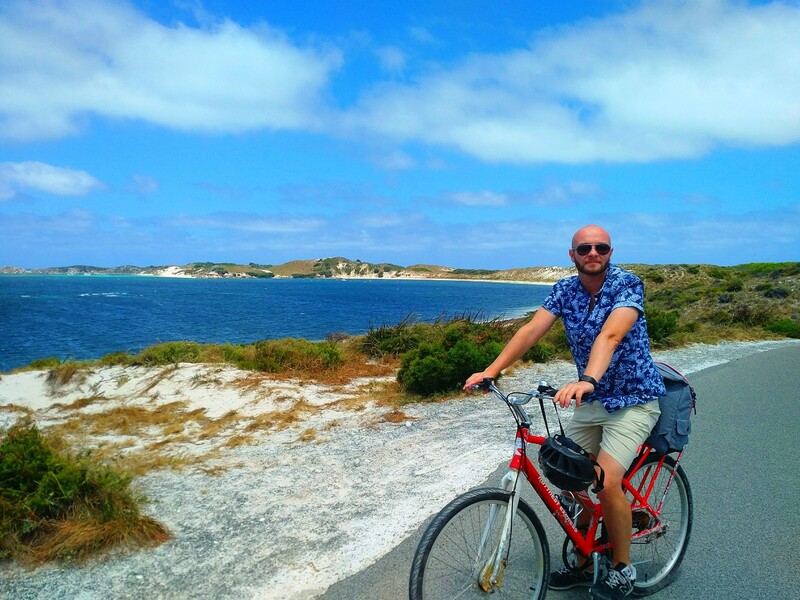 The only way to see Rottnest is by bike. It is hilly and so cycling round the island is a little more demanding that a leisurely pedal. We booked hire bikes with our ferry company which dispensed them on our disembarkation from the same ferry. Although widely ignored there is actually a $150 fine for touching the Quokkas. Ignorant tourists and cute wild animals aren't always a healthy mix. It's one thing to stroke these little creatures on the head but quite another to pick them up and cuddle them. Rangers are about to stop this sort of abuse but not enough. As an animal lover I was forced to intervene on one occasion. The ferry times are quite wide apart meaning that you're likely to spend almost the full day on the island. Initially I was sceptical that there would be enough to wile away the hours but soon found the time slipping away to our 5pm departure time. There weren't too many restaurants in Perth's CBD - so much so we gave in and returned to the hotel to have food delivered. You are best heading into the area of Northbridge for greater choice. Despite fewer tourists than other Australian cities, Perth still had very Aussie prices. Eating out was no cheaper than anywhere else in the country.